Hoping the year started off well with all of you and continues until, the not so far away now, 2019. Working hard into 2018, over the last week we have released an updated version of the Masters Toolkit Alpha addressing some of the issues that were reported by the community. All of these changes will be in the update log within the Masters Toolkit itself. To get the updated version you will need to re-download the file from the website, same method you used to obtain the original Alpha software. You will not be asked for your Key code again as long as you are using the same device you used for the previous iterations of the software. We understand that this is a pain and we are currently in the works creating a launcher and patching system to make these updates easier, and possibly more numerous. You can expect the launcher and patching system within the month, apologies for the inconvenience. Since launch, we have all had time to play around with the alpha and test it with our community, and we now have an important decision to make. We feel that the essentials pack should be a pack which you can truly use for almost any essential campaigns, and as such, we are thinking we should expand its contents. 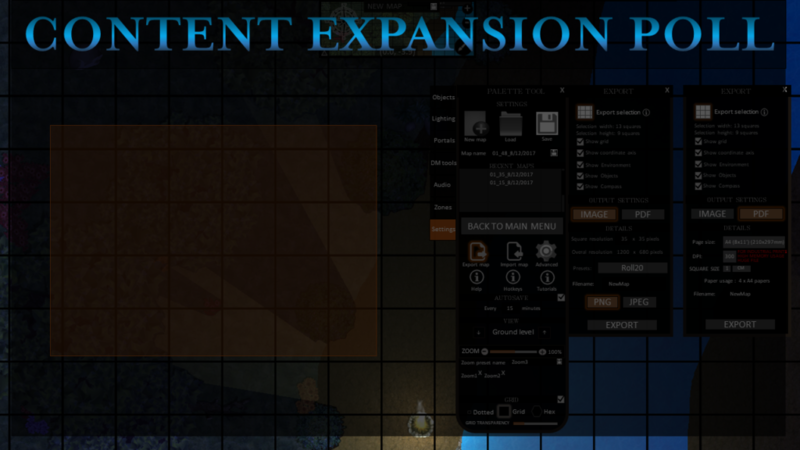 While we are happy with the quality of the content, it needs expansion to live up to its name. This will take some time to do, likely an extra 3 month delay. This is why at this fork in the road we are turning to you, our fine community, to let us know the way. Do we go left, and spend 3 months expanding the essentials pack, or we go right, keeping the eseentials pack in its current state and begin work on The Wilds pack. We will release the result of the poll in next week’s update. A reminder to all of those that backed an Atlas Classic that they have been shipped and we have the tracking numbers for the orders, feel free to email us ( info@arkenforge.com ) if you havnt received a tracking number or would like to send it again. As a final update to this week, we have noticed that people are getting REALLY creative with the Masters Toolkit Cartographer from some of the emails we’ve had. We’d like to share that with everyone so we can all keep giving each other ideas on how to use the Cartographer assets and inspire new adventures. So we’d like everyone to email us as many of their creations and ideas as they can with screenshots of what you’ve done using the software so we can showcase it with each weekly update! Spread the love!